Bethesda has released Patch 8 for Fallout 76 and it features a quest involving the search for someone’s missing brother. Poor fella is assumed to have been abducted and eaten by the woolly beast Sheepsquatch. At least that’s what his sister thinks. Hard to fathom, but in the post-war Appalachian wasteland, anything is possible we reckon. It all kicks off in Lewisburg where you will find “Sheepsquatch At My Brother” posters left behind by a woman named Shelly van Lowe. She’s searching for her brother, Calvin, who disappeared just before the Great War. Based on the posters she hung up, Sheepsquatch is to blame for his disappearance. You will investigate the mysterious circumstances behind the situation when accepting the quest Lying Lowe. These posters are also available for free in the Atomic Shop until 9am ET, 2pm UK on May 7. 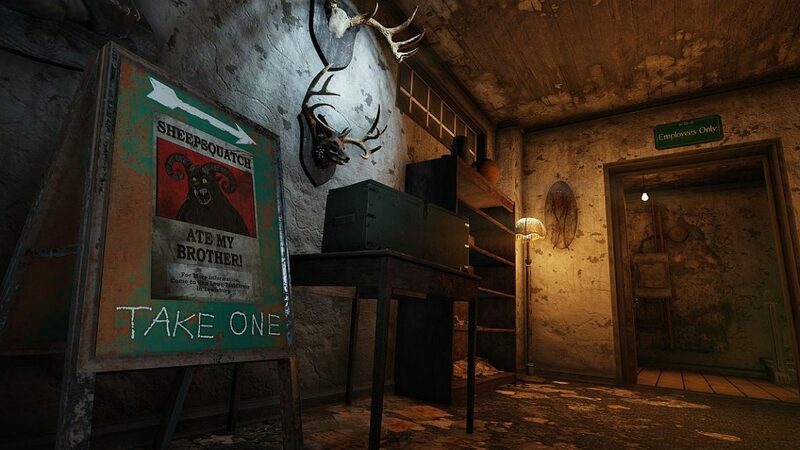 Once claimed, you can place the poster in your C.A.M.P. and read it to start the quest. If you aren’t familiar with Sheepsquatch, the cryptid is a 9-foot tall human-sheep hybrid which makes its home in the backwoods of West Virginia. It’s covered in wool and like many breeds of sheep, features curled, ram horns. Of course, it also sports a mouth full of nasty, big, pointy teeth and massive claws which very un-sheep like. While it’s native to Appalachia, the creature has been spotted as far west as Breckinridge County, Kentucky – which isn’t part of the mountain chain in the slightest. Never underestimate the power of raspberry moonshine with sticky bud inhaled as a chaser. This new, subterranean dungeon apparently offers a “challenging experience” for even the toughest roaming the Wasteland. Take some friends with you and make sure everyone’s gear is up to par. Alongside today’s new quest comes the ability to add custom names to your apparel, armor, and weapons. Patch 8 also contains changes to Death Mechanics in the Survival Mode beta; Vendor faction and Caps pool updates have been applied; and plenty of design and balance updates are included. A rather large list of bugs have been smashed to bits, and you can look over those along with all other changes through the patch notes. Have fun out there survivors, and watch out for Sheepsquatch. The post This new Fallout 76 questline has you investigating whether Sheepsquatch really ate someone’s brother appeared first on VG247.